Hacienda del Palomar was owned by José Machado. 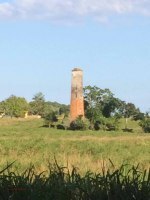 By 1902 it had installed the steam driven mill from hacienda Santa Rita in Manati wich had recently shut down to become part of Central Monserrate . We do not have much information about this hacienda nor did José Ferreras Pagán, for in his 1902 book Biografía de las Riquezas de Puerto Rico he states that Machado did not want to appear in his book therefore gave him no information on the Hacienda. Regarding José Machado, in 1903 he signed a Distillers Bond as surety for Osvaldo Laborde securing the Governmnet for the payment of taxes related to the manufacture and sale of rum by Laborde on his Hacienda Maria Teresa in Camuy. We also know he was one of the shareholders and Vice President of the short lived Central Camuy of which more can be read on the PR Sugar Mills Project page.